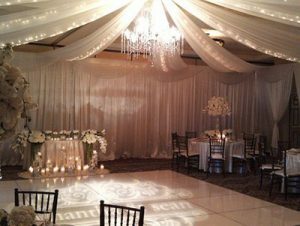 With more than 200 lighting combinations, we cater our party lighting to fit your exact specifications. If you know how you want the event space to look, we’ll create a design that matches your details, but if you’re not sure, a member of our team can come up with the perfect layout. Above all, we want you to be happy with the final result! 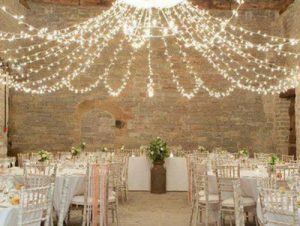 Let Lumen Lighting show you all that we have to offer in the realm of decorative lighting, including chandeliers, foliage, drapery, and more. These options are what will add those awe-inspiring and memorable features to your event. 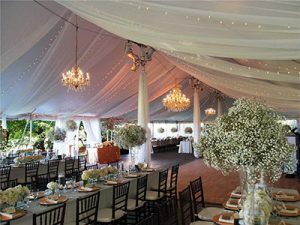 While our major service and product line is lighting, drapery and fabric play a huge role in achieving the perfect setting for our clients. No matter what kind of party you’re planning, we can create the perfect design!